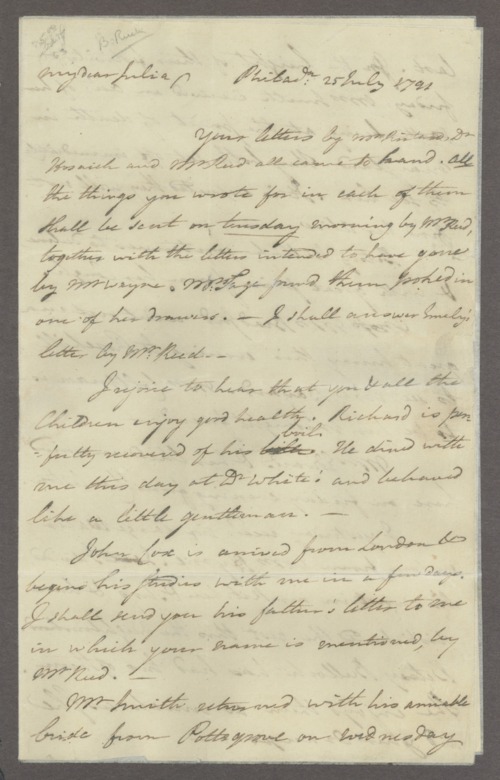 Originals and copies, sometimes also with typed transcripts, of letters written either by Benjamin Rush or his son Richard Rush, Esq. Topics include yellow fever epidemics in Philadelphia, news about family and friends/acquaintances, current reading, real estate and other property matters, religion and church, advice on health matters, legal and fiscal matters, publishing and writing, the American Revolution, the 1848 revolution in France and Major Poussin, politics and political careers, etc. Also with the papers are some court and legal documents from Richard Rush, engraved prints of Benjamin Rush, articles and other writings (often reprints) by Benjamin Rush or about Benjamin Rush, including an elegiac poem upon his death, and other related materials. Correspondents include Benjamin's wife Julia, former pupils, businessmen and lawyers, and other individuals.